Council has agreed to a set of draft planning provisions to encourage development of diverse housing in Fremantle. The future aim is to draft a scheme amendment that will help combat Perth’s urban sprawl. The new provisions will be targeted at low-density (R30 and below) zoned properties and would enable property owners in established suburbs to build smaller grouped dwellings that while retaining the streetscape and amenity of the area. This is not currently possible under the existing planning scheme. A minimum of 15% of the development site area shall be provided for a deep planting zone (for large trees) with at least one tree, to council specifications, required to be retained or planted on the site. Australian houses, comparatively to other countries, are large with the average Australian house size (floor area) amongst the largest in the world. Conversely, the average household size in Australia is relatively low and predicted to decline from 2.6 persons per dwelling currently to approximately 2.3 persons per dwelling by 2021. These factors coupled with population growth in Australia have resulted in high demand for new housing in and around Australian cities. In Perth this demand has predominantly been met on the metropolitan area’s fringe or what is more commonly referred to as ‘urban sprawl’. The housing offered in these areas is generally low density (<R30 density coding) and tends to comprise of large homogeneous homes (usually 4 bedroom, 2 bathroom, theatre room and double garage) on modest sized lots. Pushing new housing to the fringe presents a range of social, economic and environmental concerns and is not an equitable way to provide for Perth’s future population. The Western Australian Planning Commission’s (WAPC) strategic document Directions 2031 and Beyond (2010) recognises these factors and sets a target of 47 per cent of new development to provide for Perth’s future population is to be provided from infill development (as opposed to Greenfield development). 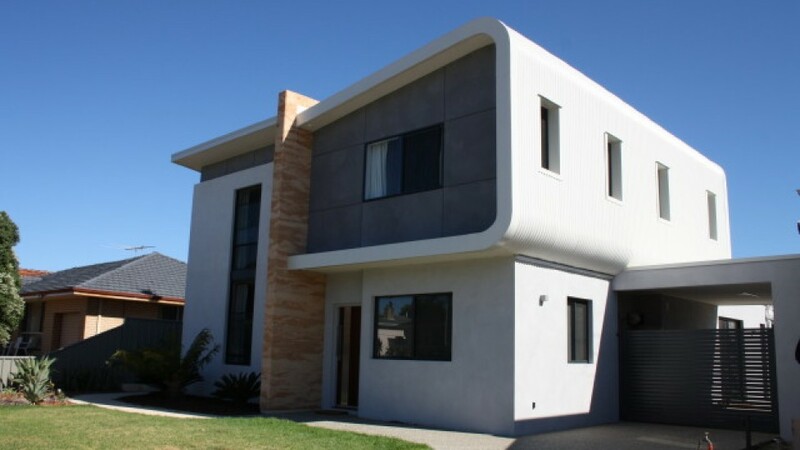 The principles discussed at council developed from key findings of research undertaken by the Australian Urban Design Research Centre (AUDRC) to facilitate the development of moderately sized housing, irrespective of the residential density coding applicable to the land. The City contracted AUDRC to model these principles based on potential scenarios to ensure that the Scheme amendment provisions could be feasible in practice and achieve the desired outcomes. AUDRC have confirmed in their report back to the City that with minor modification the principles can possibly provide for feasible development options. Fringe World is an annual arts festival featuring artists and acts from a range of styles including circus, cabaret, comedy, music, dance, theatre, film and visual art. Fringe World Perth is produced by Artrage (Western Australia) and typically is held over a four week period. In its inaugural season in 2012, Fringe World presented over 150 shows running across 30 traditional and non-traditional venues in central Perth. The 2014 Festival incorporated 450 free and ticketed shows, to be presented at more than 60 venues. 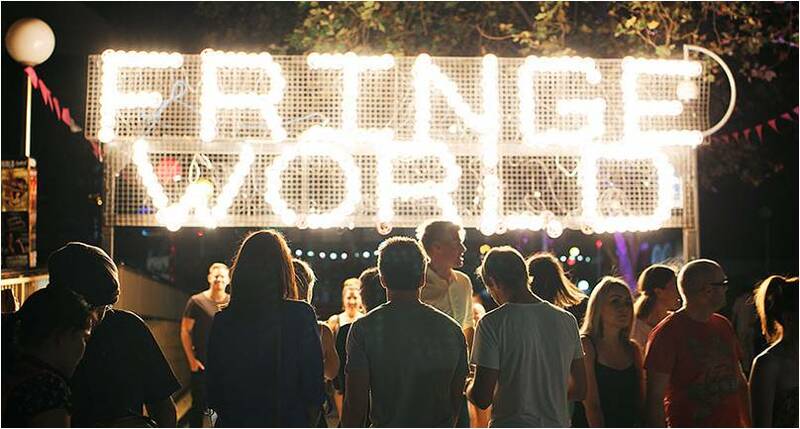 Fringe World Perth is part of the World Fringe Alliance, alongside eight key fringe Festivals: Adelaide Fringe; Amsterdam Fringe; Brighton Fringe; Edinburgh Festival Fringe; Fringe NYC; Hollywood Fringe; Prague Fringe; and The National Arts Festival Fringe of South Africa. Event organiser ‘Vulture Culture’ approached the City with a sponsorship proposal to manage the Fremantle component of Fringe World Perth 2015. The proposed Fremantle performances will come under the umbrella of Fringe World 2015 and will be promoted as part of the whole Festival and included in the Fringe World Program. .
50 – 100 individual acts/shows. 3,000 tickets per week for four weeks. Council has approved to part-fund the production of a formal business case and concept plan for the co-location of South Fremantle and East Fremantle Football clubs at Fremantle Oval. The joint initiative between the two WAFL clubs, WA Football Commission, Fremantle Football Club, Department of Sport and Recreation (DSR) and the City of Fremantle will ensure the long-term sustainability of Fremantle Oval as a sporting and community facility. The business case will allow the City to properly assess the value, cost, risks and value of the proposal along with the stakeholder needs for the facility. The City will now work with DSR to seek quotes from suitably qualified providers with a member of each of the above stakeholders to form part of the working group to oversee the process. Expectations are that the process will take six to eight months once commenced. In June, 2014 the two local Fremantle WAFL football teams released an announcement that they would consider co-location at Fremantle Oval. In July the City met individually with representatives of the clubs, the Department of Sport and Recreation and the WAFL. During these conversations co-location was discussed and it was agreed that DSR would organise a meeting between these stakeholders and the Fremantle Football Club to consider the merit. Further meetings were held in early September with agreement by the above stakeholders to develop a business case for the proposal. The business case will consider the objectives, benefits, value for money, scope, risks, costs (including asset life costs) and options. It is expected that the business case will provide a recommendation with alternative options based on objective appraisal of their strength and weaknesses. Fremantle Councillors John Strachan, Rachel Pemberton and Andrew Sullivan have been appointed along with four expert community members to the City of Fremantle Green Plan Working Group. The three councillors will join with expert community members Dr Martin Anda, Dr Paula Hooper, Mr Clinton Matthews, Mr Francis Burke and Mr Luke Priddle, to identify opportunities for new green spaces in Fremantle and to recommend options for upgrades to existing parks and linkages. being responsive and adapting to climate change. The result will be a Greening Fremantle Plan to empower the community to assist in the delivery of greening programs. expert community members with demonstrated background in delivery of parks, green space, nature play and environmental/biodiversity management (CEO to have delegation to appoint). In response to community advertising, nine individuals nominated themselves to serve as expert members on the working group. While all nominees could offer significant experience and expertise, City officers shortlisted four nominees who between them offer a broad range and depth of expertise in the fields of parks and landscape design, nature play, urban design, sustainability (including urban greening and water efficiency) and academic/research knowledge relevant to green spaces. The full agenda and minutes of this and previous meetings can be found in the agendas and minutes section of the City’s website. You might have noticed a flock of farmers hanging about in Pioneer Park? The rumour is they are hanging out to see a new play a Spare Parts Puppet Theatre that kicks off this weekend. Farm is a new work at Spare Parts that has been created in partnership with the community in Merredin over the past two years. The Flock of Farmers is an installation of ‘farmers’ each decorated by small groups of students from Merredin to represent their town. Today (26 September) is the UN’s International Day for the Total Elimination of Nuclear Weapons. 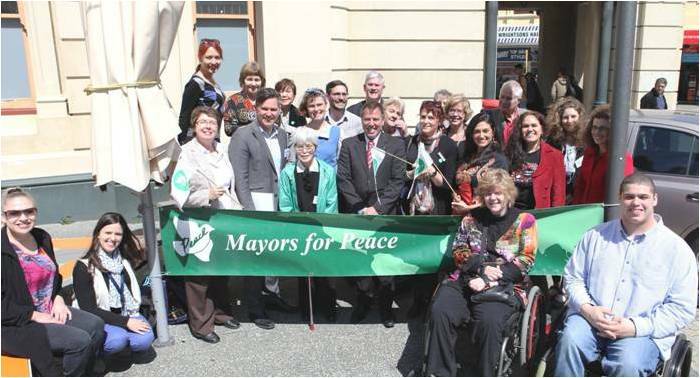 Mayors for Peace in WA is commemorating this day by sending out the “Fremantle Declaration”, a document agreed to by those mayors and local councillors attending Monday’s first ever WA Mayors for Peace conference, which was held in Fremantle earlier this week. The conference was very interesting and including a moving talk to several hundred people including school students by Junko Morimoto of her firsthand account of the atomic bomb that was dropped on Hiroshima. There are currently nine countries with nuclear weapons (US, China, Russia, UK, France, Israel, North Korea, India and Pakistan) who have over 16,000 nuclear weapons between them. The power each of these bombs is on 20 to 1000 times the power of the atomic bomb that was dropped on Hiroshima. The Mayors for Peace organization was born out of Hiroshima and is now actively campaigning for the abolition of nuclear weapons by 2020, under the campaign motto “Cities are not Targets”. This supports similar calls from the International Red Cross, and other humanitarian agencies, which have noted that neither civil emergency or NGO agencies are equipped to deal with the catastrophic impacts of nuclear war on humanity and the environment. The evidence is that even a limited nuclear war in our region would have the effect of killing tens of millions initially, and then hundreds of millions globally, because burning cities would quickly create a veil of debris in the upper atmosphere that would last for decades. Scientific research backs up the notion that we would have summer frosts in the wheat belt. There is no local nuclear war – even a limited one – without it having global effects. Mayors for Peace is a worldwide movement of over 150 countries to ban nuclear weapons, as well as establish cultures of peace in every government. Comprising more than 6,200 cities. The Freo Council will continue to take a lead role on this. Call on the Australian Government to actively support international negotiations for a treaty banning nuclear weapons once and for all. One week, three announcements and some good moves towards Fremantle’s innovative future. There have been some exciting and inspiring announcements in Fremantle this week. First, tonight The Mantle will open its doors. The Mantle is a very funky and innovative new hospitality business on the cnr of James and Beach streets in the East End of Fremantle. A few of us got a sneak peak inside last night (see photo) and it looks amazing. It has a small bar, restaurants including a relocated Don Tapa, a commercial kitchen for hire, and shared work spaces – and it looks fantastic. Another business that also opened this week is a semi-secret concept store which also acts as a cultural hub combining high-end streetwear (exclusive to the WA & Australian market), specialty coffee, and even a secret barbershop. I’m not going to show you any photos of this because you need to be as pleasantly surprised as I was but the address is Basement, 1 Pakenham Street. Look for the hourglass symbol on the semi-secret basement door! Finally this week there was also a very pleasing announcement that that construction for the renewal of the Dalgety Woolstores (aka Fort Knox) will commence in mid-December this year which is great news (see photo mock-up of courtyard). This great re-use of an iconic Fremantle heritage building will also bring several hundred extra people into the centre of Freo. What all of these great new projects have in common is the kind of innovative, bespoke and creative approach that we are encouraging to be at the heart of Fremantle’s new retail, hospitality and apartment developments. Each of these projects is hip, urban, and unique and I love how each of them in their own way is reusing and reactivating Fremantle amazing heritage spaces. Well done to all involved. Check them out. This Friday 19 September the streets of Fremantle will come alive as parking bays are taken over by local businesses, citizens, artists and activists. 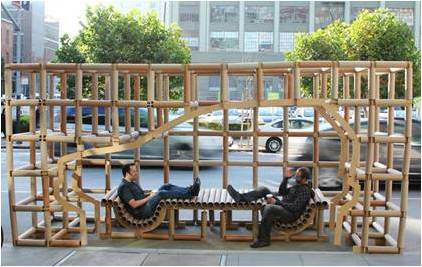 Originally invented in 2005 by Rebar, a San Francisco-based art and design studio, PARK(ing) Day challenges people to rethink the way streets are used and reinforces the need for broad-based changes to urban design and infrastructure. “In urban centres around the world, inexpensive curbside parking results in increased traffic, wasted fuel and more pollution,” says Rebar’s Matthew Passmore. Local environmental consulting and landscape architecture firm Ecoscape, has partnered for the past two years with the City of Fremantle to coordinate this community event. With the support of the City, Ecoscape are growing and promoting this annual event to encourage thought and discussion around the idea of alternative urban open space and to challenge current assumptions about traditional models of development and transport. From pop up green space, to a silent disco, to an outdoor reading space and beyond, Fremantle will support a day of outdoor activity, community connectedness and new urban vision. A walking map will be available from “PARK” installations all day and activities will run from 10.00 am until 5.00 pm. Since its inception in 2005, the project has blossomed into a worldwide grassroots movement: PARK(ing) Day 2011 included 975 installations in more than 160 cities in 35 countries on six continents. This year, the project continues to expand to urban centres across the globe, with Fremantle once again joining the fun. For more information regarding Fremantle based PARK(ing) Day activities contact Melanie Bainbridge on 9432 9735 or melanieb@fremantle.wa.gov.au. About Ecoscape (www.ecoscape.com.au)Ecoscape is a North Fremantle based environmental consultancy, landscape architecture and spatial planning firm, combining science and design in approach to their projects. Last night the Freo Council held a special meeting of council and granted planning approval for the redevelopment of buildings in and around Atwell Arcade which run from the High Street Mall to Cantonment Street in Fremantle. This is a major redevelopment and is not surprisingly attracting some controversy so i thought it would be worth explaining our decision in some detail. First I want to say decisions like this are hard but in an 11-1 vote i think Council made the right call in overwhelmingly approving this for a couple of key reasons. First – is it is a good heritage outcome. While the Atwell Arcade itself will be largely demolished and rebuilt we are in reality not losing much authentic heritage stock. While the arcade might look old to the untrained eye most of it is relatively new as in 1979 Atwell’s arcade was renovated and substantially altered. The proposed development includes major conservation of the buildings at 120 High Street and 3 Cantonment Street. The size and prominent locations of these buildings means that the works have the potential, if undertaken correctly, not only to ensure the survival of these buildings but also to improve their settings in High Street and Cantonment Street It is proposed that Atwell Buildings (112-122 High Street) be retained and its interior and exterior conserved. Works will include the restoration and reconstruction of the external facades of the building. This will involve stripping all paints and cement renders from the walls to reinstate the original finishes, all in accordance with good conservation practice. It is also proposed that the upper floor be adapted, in part to retain existing uses but also for the introduction of a new use as tearooms. Similarly it is proposed that the commercial building at 3 Cantonment Street be retained and its interior and exterior conserved. This brings us to the second reason – it is a great economic outcome for central Freo. The construction of the four storey (with basement) multiple-use development will include office and quality retail components in what will be a much-needed boost to Fremantle’s High Street Mall precinct. The development has the potential to bring significant activity to the area in the form of up to 300 office workers and high-quality retail offerings. That is more workers than are in the City of Freo building in the Freo CBD. The development clearly aligns well with the City’s broader revitalisation strategy. The West End is an area of heritage significance and its heritage values are embodied in the distinctive qualities of its inherited urban form and built fabric. The West End should be conserved for present and future generations in ways that will best sustain its heritage values, while recognising opportunities to reveal or reinforce those values. This will not be achieved if Fremantle does not have sustainable economic growth. To achieve this Fremantle must compensate for the losses caused by the decline of its port related industries by developing new ways of persuading people to come back to the centre of the City to live, work and socialize. It is not the aim of conservation for the West End to become solely a memorial of the past, nor would it be desirable, instead it is to re-establish its historic character as a lively, successful, multi-layered urban centre. This is likely to require new forms of urban expression for the new types of trade, commerce and socializing to conserve and at the same time enrich the historic character of the area. Or to put it simply – the best way to sustain the heritage values of a place is to keep it in active and economically viable use. Mr Henry Atwell (1831 – 1908) arrived in WA as a convict on board the Merchantman’s first journey in 1863 after being sentenced to life. He made good and built the original Atwell Arcade as a proudly modern building. I like to think he’d approve of this latest evolution. While we are talking sustainability, local Freo home owners, Tim and Michelle, will be opening up their green home to the general public for Sustainable House Day 2014 (Sunday 14 September) to educate and inspire us all. Sustainable House Day, is a national event that utilises peer to peer education to promote the benefits of integrating renewable energy , recycling, and other sustainable practices into the home and everyday lifestyle. Some of Australia’s most environmentally progressive homes will open up to the general public to provide practical information on how to successfully live more eco-friendly. Tim and Michelle will share their knowledge and experiences of what worked, what didn’t and how it has change their way of life. You can tour this local home at 10 McLaren St, South Fremantle between the hours of 10am to 4pm on Sunday September 14th.